It’s a Family Heirloom - This will be the first family heirloom you create with your spouse! How special is that? You can make a new family tradition to look at it every year on your anniversary. Kids love books, especially ones with faces they know. Analog Creates Interaction - Make a home for your wedding album on your coffee table or a bookshelf in your living room and I guarantee people will grab it and flip through it. Each time gives you an opportunity to relive that special day by sharing your story and giving them the opportunity to share something they remember about the day if they were there. You don’t see a CD or a USB drive hanging on people’s wall and we don’t typically take our friend to our computer to flip through a disc of images that now takes forever to load. Technology becomes obsolete so quickly. Don’t lose your images. 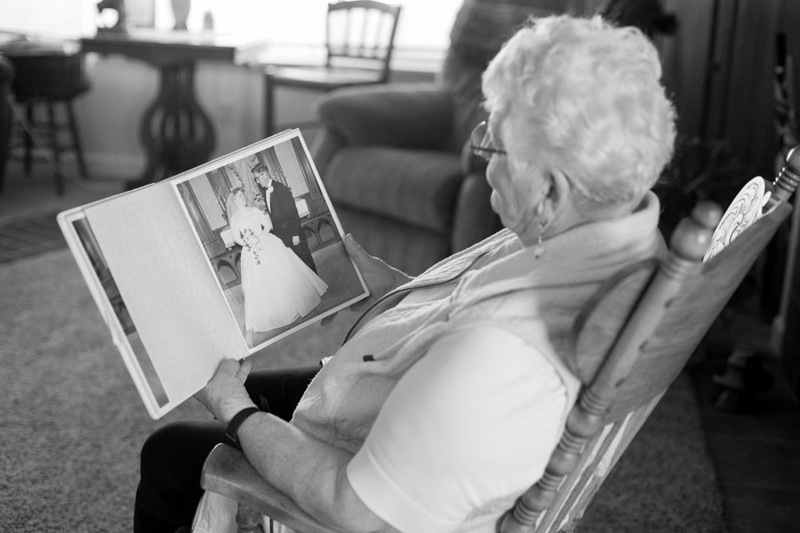 Longevity - Pictured above is my grandma looking through her own wedding album. Que the emotions. This beautiful book has been looked as so many times over the last 50+ years and it’s still in almost perfect condition. Albums themselves may have changed a lot over the years but what they represent only becomes more valuable over time. Design - You may have noticed that I said “order a wedding album through your photographer”. I may be a little biased on this detail, and truly whether you order it through your photographer or not, I just hope you order one. The advantage you get by ordering it through your photographer is: 1) design help, them or their designers have most likely designed countless albums. They know the best way to layout images to create the story of your day. 2) Professional products, they also know the best archival products to order so that your album is sure to last generations. There is something to be said for a physical product these days that have a life expectancy of more than a year, it seems. What if I was married X number of years ago, can I still get an album? - YES! If I was your photographer, I would be more than happy to create a wedding album for you no matter when your wedding was! If I was not your photographer, I’m sure they feel the same way as I do and would love to help you out! If you are unable to order from your photographer, for whatever reason, but you have the digital files, there are many services or companies that will help create one for you. Just print your photos! How much does a wedding album cost? - A custom wedding album is an investment. I will never use the word cheap when talking about them, and you wouldn’t want someone to when it’s something you want to last for generations. There are many factors that come into a wedding album price including product style, product size, number of images or number of pages. I’d be happy to talk over the options and give you a quote on your wedding album. I believe there is something magical about seeing your images in print. This goes for more than just wedding albums. Creating an album of your family photos, senior session or maternity images is a cost effective way to have multiple images in one spot for people to view.